It is indeed the season of giving, but sometimes we forget that giving is not measured by the amount of the things we give, as the saying goes "it is the thought that counts". This year Hapee Toothpaste releases this video that made me realize that it is also important to give back, in this day and age wherein we are too busy achieving so much in life, we tend to forget to say thank you to all those people in our lives who in a way made our life and work bearable. So please join me in watching this very touching simple story of how we can give back and be inspired. Please do share the video and use #HapeeDelivery to share the happiness. Say hello to the complete family model of the LG G3. It is once again a pleasure to be invited to such events such as this. I must admit, I am totally inlove with my first smartphone which is the LG G2, I am very much satisfied with its features and usability that it fits my lifestyle very well. A few months ago, the latest model LG G3 was launched and it still gave me the excitement to have one, but of course in reality it was a bit expensive but that's because it is one of the best in the market. But, no worries because LG now announces their newest phones in line with the LG G3 generation. Read below and be amazed and you might even consider getting one for yourself or for your special someone this holiday season. MANILA, December 1, 2014 – The premium mobile segment global technology innovator LG Electronics comes in full swing as the LG G family introduces the G3 Beat, G3 Stylus, and G Watch R to the Philippine market. The LG G3 Beat and Stylus are off-springs of the multi-award-winning smartphone LG G3. Carrying the best features of the highly-acclaimed flagship, these new offerings allow Filipino consumers to have the G3 experience at a more affordable price. 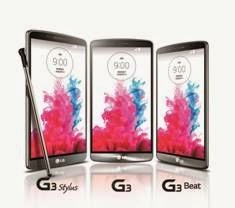 The LG G3 Stylus, LG’s new pen-enabled smartphone that inherits the core DNA of the LG G3, brings a premium stylus experience in a smart priced package. LG’s proprietary RubberdiumTM stylus pen slides inside the G3 Stylus, which feels comfortable in any hand and complements the phone’s 5.5-inch large display. Users can pair it with LG’s QuickMemo+ to take notes or draw directly on images or maps in a breeze. The stylus is also compatible with a number of third-party handwriting and drawing apps. The LG G3 Beat retains the best features and functions of the G3 in a more compact and handy package. A testament that less can be more, the LG G3 Beat comes with a largest-in-class 5.0-inch HD IPS display with a screen-to-body ratio of 74.1 percent, the highest in the mid-tier smartphone segment. The LG G3 Beat offers impressively thin bezels and a robust 2,540mAh battery. It features the Floating Arc Design first unveiled on the LG G3, boasting smooth curved sides and gradually tapered edges for the ultimate comfort in grip and feel. Both the G3 Beat and G3 Stylus’ 8MP and 13MP shooters, respectively, carry over the G3’s key camera features such as Touch & Shoot, Gesture Shot and Front Camera Light. Additional UX features that have become standard offerings across LG’s newest smartphones include Dual Window, Smart Keyboard and Knock CodeTM. Both also have the same Floating Arc design with gradually tapered edges, thin bezels and metallic skin back cover that was first introduced on the LG G3. Both devices also sport the revolutionary rear key. 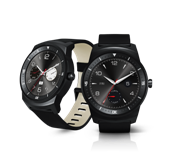 Smart comes in full circle with the new LG G Watch R, which has already garnered global praises for its stylish look, inspired by classical and premium experiences, and smooth and speedy performance. This is the world’s first watch-style wearable to feature a fully circular Plastic OLED (P-OLED) display at 1.3 inches, taking advantage of every pixel and producing images of stunning color and accurate viewing at all angles even under bright sunlight. LG G Watch R features a classic design encased in durable stainless steel and aluminum powered by a 410mAh battery, the largest in an Android Wearable to date. It delivers optimal performance through its powerful but efficient 1.2GHz Qualcomm® Snapdragon™ 400 processor with 4GB of storage and 512MB of RAM, and is completely protected from dust and water resistant for up to 30 minutes at a maximum depth of one meter. Other impressive features of the LG G Watch R, when paired with a smartphone, include information on weather forecast, real-time traffic conditions, turn-by turn navigations, stock market updates, social media notifications, and travel and restaurant updates. The device also allows the user to track fitness goals and use the Ok Google feature to send a text message, email, or play songs through the Android WearTM music. Starting this December, Globe is offering the LG G3 Stylus for free at Plan 1299 and it comes with 3Gb mobile internet, Chat Bundle, Photo Bundle, 200 texts to all networks and 10 minutes of all-network calls plus free one-month NBA League Pass Access, free three-month Spotify Premium Access, and free one-month Gadget Care. The LG G3 Beat is free at Plan 999 and comes with 1.5Gb mobile internet, Photo Bundle, 300 texts to all networks and 15 minute of all-network calls plus free one-month NBA League Pass Access, free three-month Spotify Premium Access, and free one-month Gadget Care. Also at Plan 999, Globe offers a phone and tablet bundle from LG—the LG L60 smartphone and the G Pad 7.0 WiFi tablet. For more information on LG Mobile’s innovative product line, visitwww.lg.com/ph, www.lgblog.com.ph, or www.LGnewsroom.com; like LG Mobile’s official Facebook page ‘LG Mobile Philippines’; or follow @LGPhilippines on Twitter and Instagram. 1) Go to www.GMANetwork.com/sharethelove and click on the promo tab. 2) Watch the featured video. 3) Submit the correct answer to the question of the day. For every participant, only one entry is allowed per day. Five daily winners will be randomly drawn and announced everyday from December 1, 2014 until Christmas. What are you waiting for? Join now! All you have to do is wait, watch, and win! For the full mechanics, visitwww.gmanetwork.com/sharethelove. 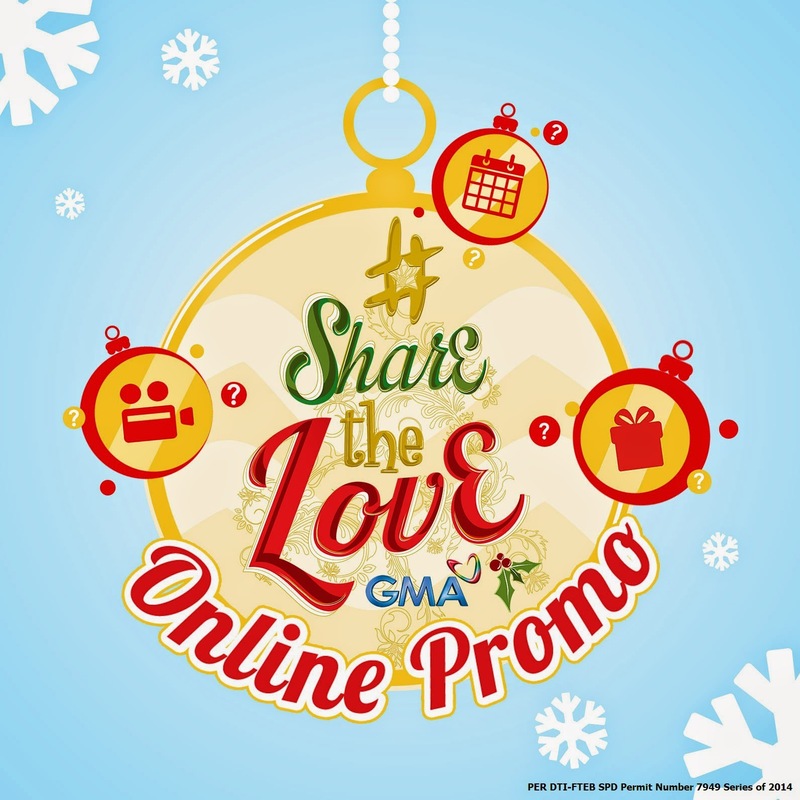 Let's all #ShareTheLove this Christmas, mga Kapuso! It's Time To #ShareTheLove Mga Kapuso! I was invited to this event called "Kapuso Quiz Night" which I didn't have any idea of some sort, but of course its a quiz contest kind of event. When everything was set, there it was, a music type of quiz was about to happen, I was both excited and nervous. Excited because I love music but nervous because I am not too updated lately. Anyway, we were joined by two of the cutest male Kapuso stars, James Wright of the primetime serye Strawberry Lane from team 1 (Team Ganda Lang) and Mikoy Morales from the newest serye "More Than Word on my team (Team Energy). So the game started with the first round wherein the music will be played and we have to guess the song title and the artist, second round was state the movie, show or teleserye wherein the song was used and finally the final round, we had to sing the chorus of a song and the lyrics should be correct. Oh there were bonus rounds in between called first to tweet (I am proud to be fast on this one lol!). The game has extracted all the energy in our body that during the final bonus rounds my team and I were so tired and just gave the extra points to the other team (excuses), they won! It was a good game and experience playing with the two young men. 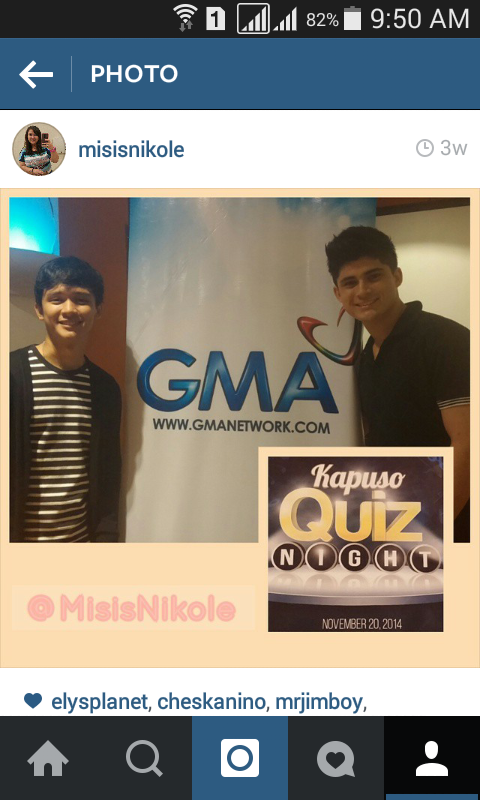 Both James and Mikoy loves music and they were actually the main source of points for both teams. But because Mikoy is on our team I can actually say that he was a genius! I remembered there were songs that were played, first 3 seconds and first few notes and boom there he goes writing on our white board and it was the correct answers. I was in awe on how he looked like just a regular teenage boy but with pure talent in music. That night I became an instant fan, not because they were just your regular cutie boys next door but because their talent totally boost their whole profile. Note: I wasn't able to take photos because I was too focused on the game, spell competitive!